The visually arresting island chain of the Maldives is located south of the Indian Subcontinent. From the sky, the atolls appear like pools of coloured oil on water, and this is usually how you will first see them, from the window of your aeroplane into Malé International Airport of from your seaplane transfer to your resort. In recent decades travel to the islands has rocketed, particularly for honeymooners, and on a visit to the paradise islands you’ll see why. Are you considering where to go on your honeymoon? 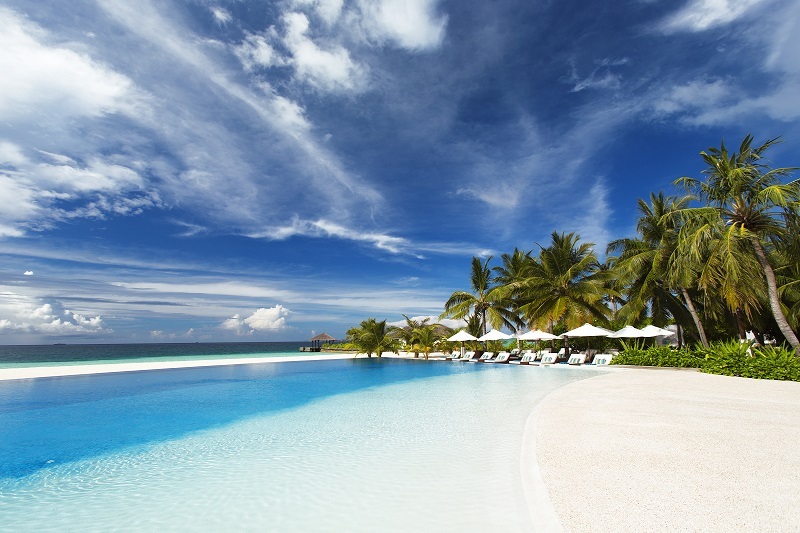 Read on for our top five reasons why you should choose the Maldives for your honeymoon. You’re on honeymoon, so it’s right that you want to spend time with your newly betrothed – just the two of you. As one of the most remote places in the world, the Maldives is actually quite devoid of people. You may think that due to its stunning natural beauty people would be flocking here in their droves, but due to the intimate size of the resorts you’ll often feel like you’re the only people around. Of the 1,190 island, only 200 are inhabited and 90 of these are dedicated to luxury resorts. The resorts themselves take privacy very seriously too, with overwater villas shielded from other guests by careful thatching and alignment and beach villas secluded by greenery. Many have private beaches or direct access to the sea, so there’s no need to fight for your spot on the sand. If it’s true isolation you crave then many of the hotels will take you on a trip to an uninhabited island, leaving you there to relax with a picnic and a phone, so you can call to be collected. Whether you’re an eager learner or an experienced diver, no one can fail to be amazed by the incredible diving on offer in the Maldives. Consistently voted some of the best in the world, almost every resort has its own house reef (or access to one) and a PADI-accredited diving centre so your dives are safely operated by professionals. 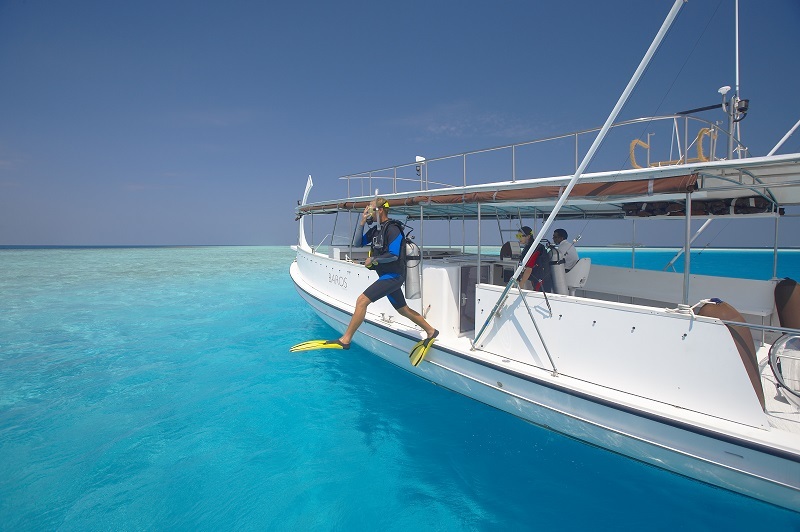 With exceptionally clear, warm waters, healthy coral life and great visibility, the Maldives is one of the best learn to dive destinations in the world, with rewarding dive sites just a few hundred metres off shore and plenty of opportunities to dive further afield. On a typical dive you may spot barracuda, Hawksbill turtles and brightly coloured fish like the curious boxfish, butterfly fish and oriental sweetlips. Experienced divers can take the opportunity to swim with whale sharks, spotted all year round, rays or even brave an early start for the chance to dive with hammerhead sharks. 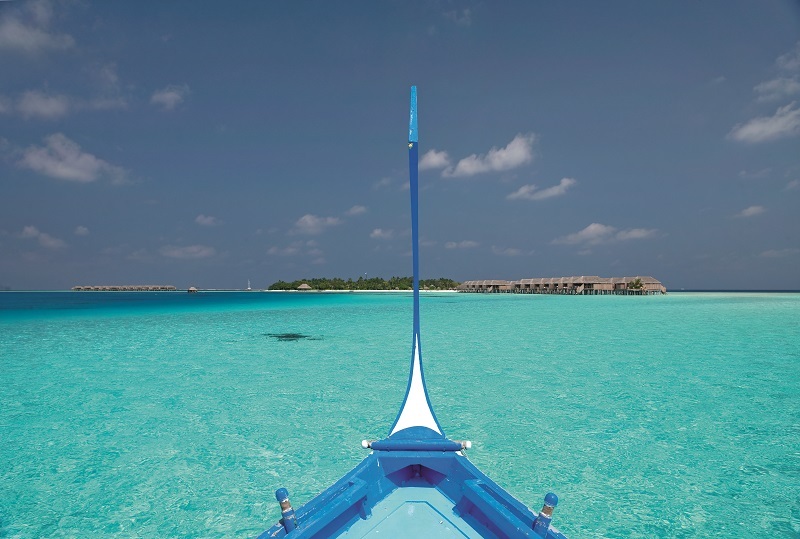 We couldn’t mention the Maldives without mentioning the weather – it’s glorious! Temperatures average between 25 – 30 degrees all year round, and April is on average the hottest month (and the start of wedding season – convenient!). Of course there is the chance of rain in off season, so if you want to increase your chances of only way you getting wet is swimming in the lagoon then visit between December to April for the driest months. Imagine crystalline waters, remote paradise beaches warmed by the Equatorial sun and gentle tropical breezes gently fluttering the leaves of the palm trees: this can be your reality on a honeymoon to the Maldives. 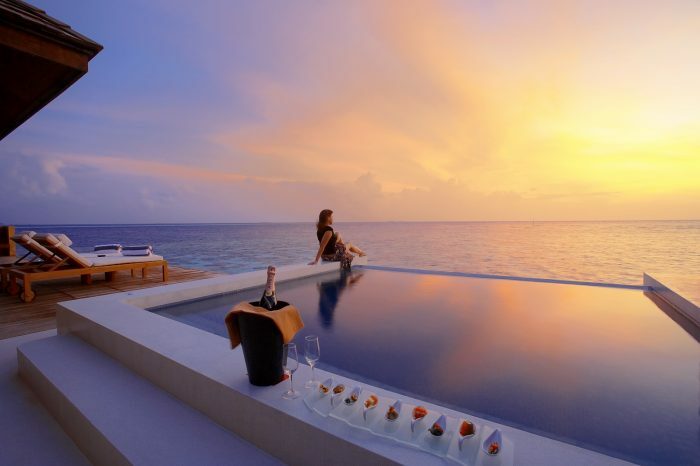 For more on When to visit Maldives. Guests of luxury resorts demand the very best, so it’s unsurprising that the Maldives are home to incredible gastronomy. At the crossroads of Asia, India and Africa, you’ll find a huge array of international cuisine on offer, from Japanese teppanyaki to gourmet Italian, so there will always be something to float your boat. Restaurants make the most of the bountiful seafood on offer, from plump grilled tiger prawns to red snapper and tuna steaks – you can even catch your own dinner on a fishing excursion and have the restaurant cook it for you. Unsurprisingly, the super-fresh sushi is delicious, too. Many of the resorts have their own kitchen gardens and even farms and everything that cannot be produced nearby is flown in, from wagyu beef to Italian deli items and more varieties of champagne than you can shake a stick at. If vegetarian is what you fancy you’ll be well catered for, with a huge choice of vegetarian options; Just Veg at Atmosphere Kanifushi, the only dedicated vegetarian restaurant in the country, is one of the best restaurants in the Maldives and included in the all-inclusive plan. The island chain is also big on dining experiences, from casual lunches with your feet in the sand to fusion cuisine served below the waves at Per Aquum Niyama’s underwater restaurant, Subsix. 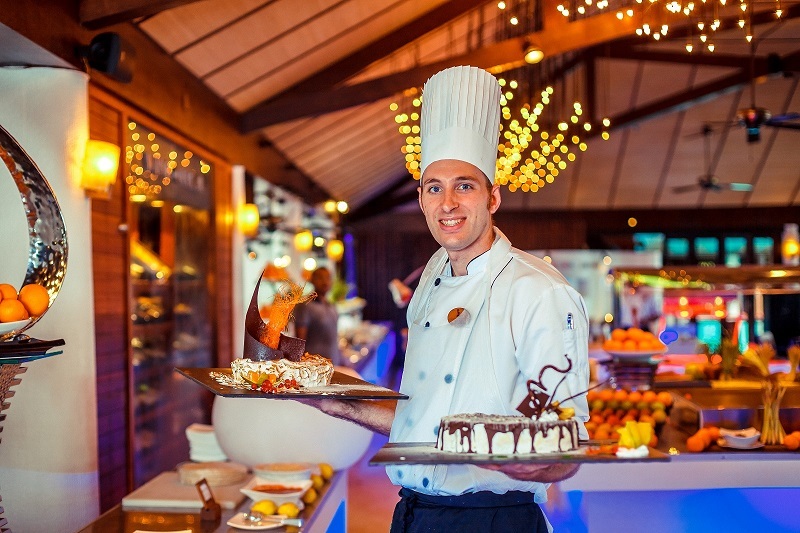 You’ll find all manner of smoothies, fresh fruits and coconut, as well as delectable desserts to tempt your taste buds. With luxury resorts come luxury spas, and they don’t come much more luxurious than in the Maldives. Most resorts are equipped with unashamedly luxe spa facilities, from treatment rooms set over the ocean in thatched villas overlooking the lagoon to tranquil outposts of relaxation just steps from the beach. Those looking to surrender themselves to complete relaxation will find themselves overwhelmed with options for wellness packages where you can curate your own spa programme with a selection of traditional salon treatments, massage and holistic rituals utilising ingredients derived from the islands. Serious spa junkies will relish the more unusual treatments on offer, from Ayurveda and massages using Maldivian coconut oil harvested locally. You don’t even need to leave your partner’s side to enjoy a treatment, as couples’ treatment rooms come as standard. You could even leave them to work out in the well-equipped fitness centres or indulge in complimentary yoga while you enjoy more pampering. 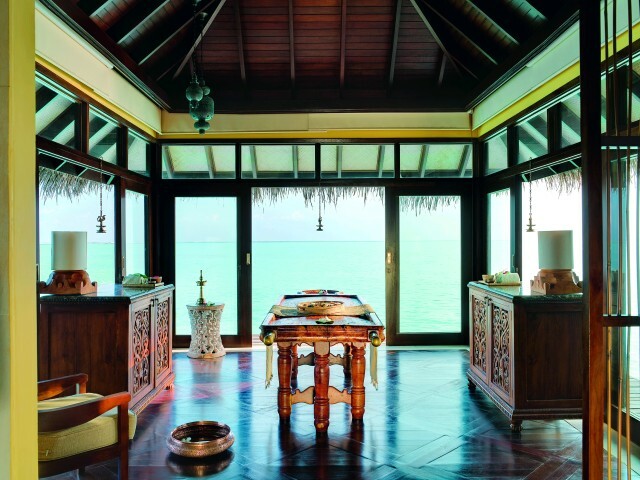 Some of the best spas include ESPA at One&Only Reethi Rah, with treatments to prepare your skin for safe sunbathing, or the LIME Spa at Niyama, with the world’s first underwater spa rooms. Want to find out more, contact our expert honeymoon planners… they are always excited to talk about Maldives honeymoon experiences.